Follow The Migraine Warrior on Facebook! While sleep is most certainly a refuge for many Migraine Warriors, it can also be a cruel mistress, eluding us when we need it most. The term “painsomnia” comes to mind: insomnia caused and/or worsened by pain. Often, my migraines make it too painful for me to sleep. Additionally, many medications used to treat migraines contain caffeine and/or steroids, both of which are notorious for amping people up rather than calming them down. I have the added bonus of having adverse reactions to many medications often used in the treatment of migraines and nausea associated with migraines. It almost seems like a cruel trick. It is at this point that distraction becomes my only option; tossing and turning creates nothing but anxiety and frustration. People often wonder how migraineurs (a fancy word for people who have migraines) are able to be on social media during a migraine attack. The answer is simple: a dim screen on a tiny phone in an otherwise pitch black room helps us to feel less isolated. We are often conversing with others going through the same situation, providing comfort, empathy, compassion, and friendship. Just as you cannot truly understand what it feels like to give birth until you have done so, one cannot truly understand what it is to endure a migraine until he/she has suffered through one. 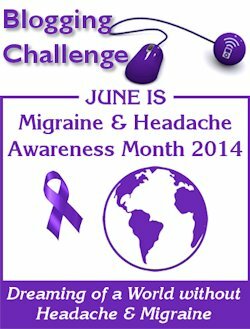 Rule of thumb: If you are unsure as to whether you’ve had a migraine, you haven’t had one. If you “think” you “might” have had a migraine, you haven’t had one. Migraines are not subtle in revealing themselves. I was inspired to write my own poem as a result of today’s prompt. I never really understand how much you suffer until I read something like this. I wish I could take away your pain, but I can’t, but I can try to be more comforting and understanding. I love you. ctracy that’s very kind of you. I’m sure your comments touch Michelle’s heart. We migraineurs need tons of love and understanding :). Absolutely brilliant post and beautiful poem! I can identify with everything you wrote. Love what you said about the computer screen. When my hubby comes home and finds me in bed in the dark (80% of the time I’m like that), he asks if he can open all the windows and blinds or sometimes just does it. He does so out of love cause depression is linked to low levels of vitamin D, I’m becoming more and more depressed as the years go by and I get very little sunlight. I’m gonna show him this post. Anyhoo, to the point. He doesn’t understand why the light stays off and the blinds and windows are shut, but I’m on the computer lol :). And I tell him the same thing, I turn the brightness down. And say if I have to lay here waiting for these meds to kick in I’m going to go out of my mind. When I have a #10 however (my number ten is a headache so bad I don’t think, but I hope I will die and I’m vomiting in intervals), I can’t do anything not even sleep until the pain subsides a bit. Again thanks for sharing. Beautifully done. I look forward to the rest of your posts for this challenge.